Gold Prices Drive Increased Business. With the addition of new Allies for Satellite based phase 1 Scanning, Geo Scan Inc. is poised to wipe out the competition. 2012 is shaping up to be the best ever, the rate of target confirmations has tripled from 2011. This is the start of a new beginning for us and our customers. With the rising prices of gold and precious metals, Geo Scan Inc. finds its self in an excellent position to help mine and claim owners maximize their potential. The cost of scanning for these resources, due to the technology advances has a very distinct advantage for the company and the mine owners. Geo Scan Inc. has positioned its self to be one of the leaders in sub-surface scanning of precious mineral deposits. Over the course of the next few years the company will be seeking maximize their earning potential. Acquisitions of up-graded software, new scan technologies and the ability to accurately asses data, will undoubtedly bring us to the top. Public and Private investment firms are showing interest in the services we offer. Interested investors are urged to contact the owners for a prospectus of expansion of operations. Archaeologists Solve Mystery of Palmyra A Norwegian-Syrian team of archaeologists has solved one of the great puzzles of the Roman Empire: why was the vibrant city of Palmyra located in the middle of the Syrian Desert? An avenue in ancient Palmyra, Syria (Zeledi) In Roman times, Palmyra was the most important point along the trade route linking the east and west, reaching a population of 100,000 inhabitants. But its history has always been shrouded in mystery: what was a city that size doing in the middle of the desert? 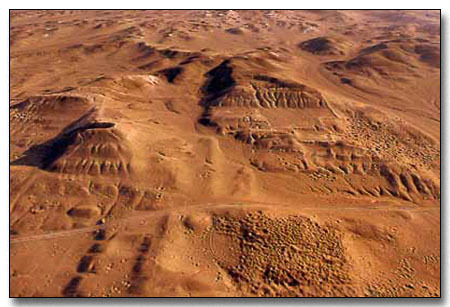 How could so many people live in such an inhospitable place nearly 2,000 years ago? Norwegian researchers collaborated with colleagues from Syria for four years to find answers. �These findings provide a wealth of new insight into Palmyra�s history,� said J�rgen Christian Meyer, a professor at the University of Bergen and manager of the project funded by the Research Council of Norway. The Norwegian archaeologists approached the problem from a novel angle � instead of examining the city itself, they studied an enormous expanse of land just to the north. Along with their Syrian colleagues from the Palmyra Museum and aided by satellite scans and photos, they catalogued a large number of ancient remains visible on the Earth�s surface. Advanced Nuclear Magnetic Resonance was used to enhance underground structures, "In this way, we were able to form a more complete picture of what occurred within the larger area." Nicola Masini and Rosa Lasaponara of Italy�s National Research Council (CNR) discovered the pyramid by analyzing images from the satellite Quickbird, which they used to penetrate the Peruvian soil. The researchers investigated a test area along the river Nazca. Covered by plants and grass, it was about a mile away from Cahuachi�s archaeological site, which contains the remains of what is believed to be the world�s biggest mud city. 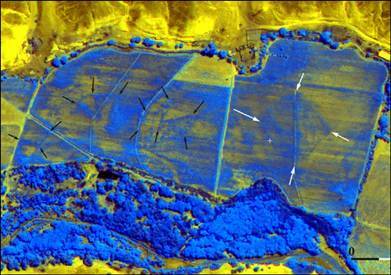 Via Quickbird, Masini and colleagues collected high-resolution infrared and multispectral images. After the researchers optimized the data with special algorithms, the result was a detailed visualization of a pyramid extending over a 97,000-square-foot (9,000-square-meter) area. The satellite services contracted by Geo Scan Inc. for our site in the Philippines, has produced tremendous positive results, we are thankful to be digging the correct location�.Results from the scanning produced more targets than we had hoped for and some closer than others. We have saved a bundle and have stopped digging dry holes. Thank You, Thank You, Thank You. It was worth every cent. The first quarter of the new year is off to the most unbelievable start, thru alignment with foreign entities, Geo Scan has positioned its self, for record profits. Changes in equipment and infrastructure have paved the way for a multitude of scannig jobs for precious metal locating and mapping through out the world. Our equipment is the best on the market, this coupled with skilled technicians and professional geologists is catapulting our business to new heights. We right now stand with 88% positivly confirmed success rate of target location. Over 70% of our clients are referred, through either the equipment manfacturers, mining entities or past clients and/or their investors. In 2010 Geo Scan successfully located and mapped over 4 billion dollars worth of gold deposits, we tracked over 6.7 miles of underground tunnels and we physically walked the terrain equilivent of 645 miles. Reports to mine owners for scanning resulted in over 27 million dollars invested to various companies, based on the outcome of the testing. Geo Scan Inc. in conjunction with our field group have developed interests in various projects across the USA. These projects will result in multiple income streams in the next 6-8 months. Early negotiations with forien goverments are currently underway for the procurement of special sites to confirm or deny the presence of large non ferrous deposits. 2011 is really starting to shape up. for all of your detector needs.